Bruce Baron is an agent for the CIA. 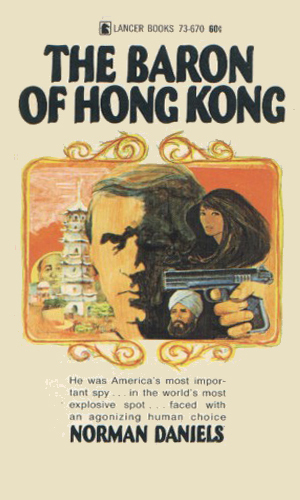 More than a decade before the first chronicled adventure, Bruce Baron was assigned by the Agency to the Hong Kong region. He was instructed to move to that British colony to set up a business as a front for his espionage activities. Being a very industrious man, Baron chose the banking industry and created his own bank, small at first, of course. In the years since his arrival, his bank has grown to a respectable size and he has branched out into other fields of endeavor. In addition to the bank, Baron started and still runs several other establishments, each quite successful. There is a high class restaurant where the movers and shakers often dine under the watchful eye of Baron's staff. A swinging night club provides recreation to people who often say more than they should after a drink or two. A prosperous jewelry shop gives a useful drop site for visitors from other regions to bring in or carry out intelligence reports. These enterprises give Baron a reason to go places a prominent banker would not and lets him deal with people of shady nature even as his banking position lets him in the doors of the movers and shakers. Baron has access to all levels of society. Baron has the reputation for being a major ladies' man and he does little to disturb that label. Handsome, rich, powerful, and a touch mysterious are the most noted features of Baron. He is also zealously determined to do his job to his utmost and as such is rated by the CIA as one of their most valuable agents. When his beautiful oriental secretary asks Baron's help in hiding her grandfather, he declines as the man was a major Chinese Communist leader now on the outs with Mao. She is soon subjected to horrendous treatment by Red Guard members and Baron knows he has no choice but to interfere. Throw in a key Chinese assassin and a seductress who laces Baron's drink with LSD and you have a very involved mission. Word that a new movement is underway in Peking to overthrow the communist government sends Baron in to see if it is true. His problem is going to be trying to get back out again with the truth. The idea of a man like Baron, incredibly successful in a city like Hong Kong and able to still act as an agent for the CIA does rather stretch credulity a lot but who doesn't like the story where the hero fights to the death in a dark and dirty alleyway and then, after vanquishing his enemy, goes home to his elegant house and has his manservant pour him a stiff drink. Mr. Daniels is a skilled writer and the story does move along at a good clip. I was surprised that he didn't write more about this character than just the two books.